Name usually given to the only known surviving inscribed monument of ancient Moab. It was discovered in 1868 at Dhiban, the ancient Dibon, four miles north of the River Arnon. When first seen by Europeans (including a German missionary named Klein) it was an inscribed slab of black basalt 3½ feet long by 2 feet wide. The Arabs of the neighborhood, dreading the loss of such a talisman, broke the stone into pieces; but a squeeze had already been obtained by Clermont-Ganneau, and most of the fragments were recovered and pieced together by him. The reconstructed monument is now, together with the squeeze, in the museum of the Louvre in Paris. "I am Mesha, son of Chemosh . . . (? ), King of Moab, the Dibonite. My father reigned over Moab thirty years, and I became king after my father, and I made this high place for Chemosh in , the high place of deliverance, because he had delivered me from all that attacked me, and because he had made me see my desire upon all my enemies. Omri, King of Israel, oppressed Israel many days because Chemosh was angry with his land; and his son succeeded him, and he also said, 'I will oppress Moab.' In my days he said this, and I saw my desire upon him, and Israel was humbled with everlasting humiliation. Omri had taken possession of the land of Medeba and [his people] occupied it during his days and half the days of his son, forty years; but Chemosh restored it in my days. . . . And the men of Gad had occupied the land of Ataroth for a long time, and the King of Israel had built up Ataroth for himself. And I fought against the city and took it, and I slew all the people from the city, a sight for the eyes of Chemosh and of Moab. . . . And Chemosh said to me, 'Go, take Nebo against Israel.' And I went by night and fought against it from the break of dawn until noon, and I took it and slew all [that were in] it, seven thousand men and boys and women and girls and maid servants; for to Ashtor-Chemosh I had devoted it. And I took from there the vessels of Yhwh and brought them before Chemosh. And the King of Israel had fortified Jahaz and occupied it while he was at war with me, and Chemosh drove him out from before me. 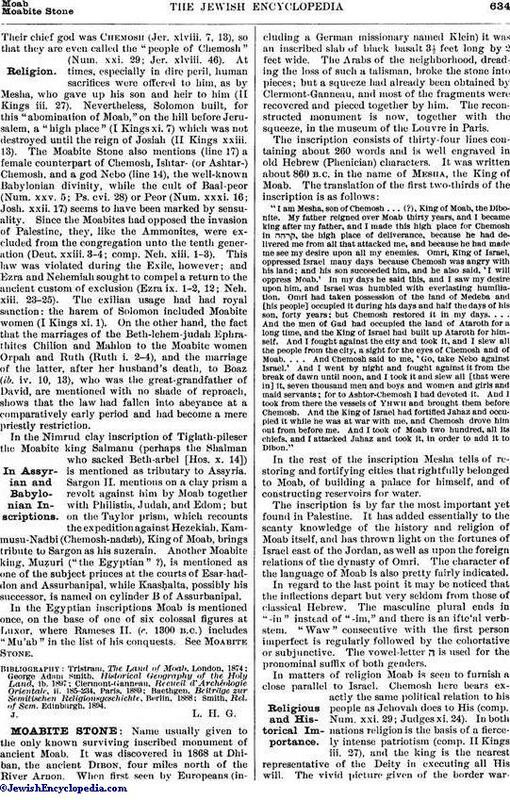 And I took of Moab two hundred, all its chiefs, and I attacked Jahaz and took it, in order to add it to Dibon." In the rest of the inscription Mesha tells of restoring and fortifying cities that rightfully belonged to Moab, of building a palace for himself, and of constructing reservoirs for water. The inscription is by far the most important yet found in Palestine. It has added essentially to the scanty knowledge of the history and religion of Moab itself, and has thrown light on the fortunes of Israel east of the Jordan, as well as upon the foreign relations of the dynasty of Omri. The character of the language of Moab is also pretty fairly indicated. In regard to the last point it may be noticed that the inflections depart but very seldom from those of classical Hebrew. The masculine plural ends in "-in" instead of "-im," and there is an ifte'al verbstem. "Waw" consecutive with the first person imperfect is regularly followed by the cohortative or subjunctive. The vowel-letter ה is used for the pronominal suffix of both genders. 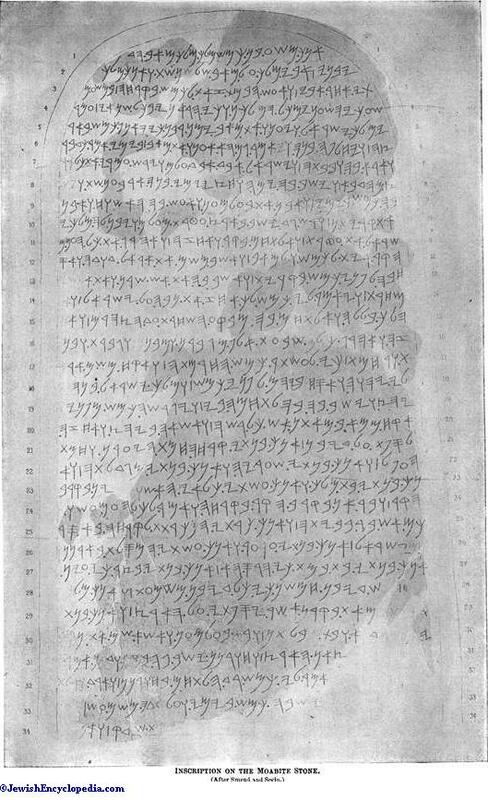 Inscription on the Moabite Stone. In matters of religion Moab is seen to furnish a close parallel to Israel. Chemosh here bears exactly the same political relation to his people as Jehovah does to His (comp. Num. xxi. 29; Judges xi. 24). In both nations religion is the basis of a fiercely intense patriotism (comp. II Kings iii. 27), and the king is the nearest representative of the Deity in executing all His will. The vivid picture given of the border warfare between Moab and Israel helps one to understand the bitter hostility of each people toward the other, and the race hatred to which Judah became heir after the fall of the Northern Kingdom. Of Israel's history it is learned that the warlike Gadites had absorbed the tribe of Reuben, and that they upheld the banner of Israel east of the Jordan. A clearer idea is obtained of the epoch-making deeds of Omri, under whom, in spite of the wars with Damascus, a large portion of Moab was annexed and the whole kingdom forced to pay an enormous tribute (comp. II Kings iii. 4); but after his day Israel gradually lost its hold upon Moab, which was thus left to its habitual repose, and, like wine, "settled on his lees" (Jer. xlviii. 11). 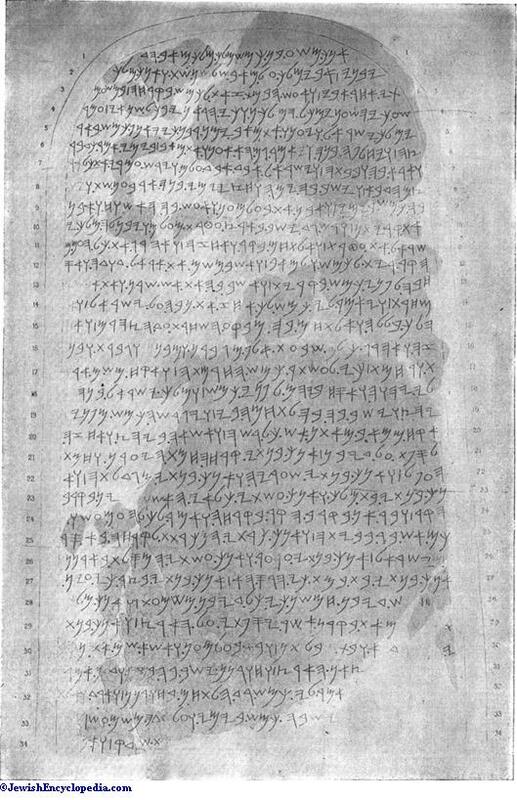 The literature in connection with the Moabite stone is quite large. Inasmuch as the elucidation of the language of the inscription is continually progressing, the later treatises are the most valuable for practical purposes. 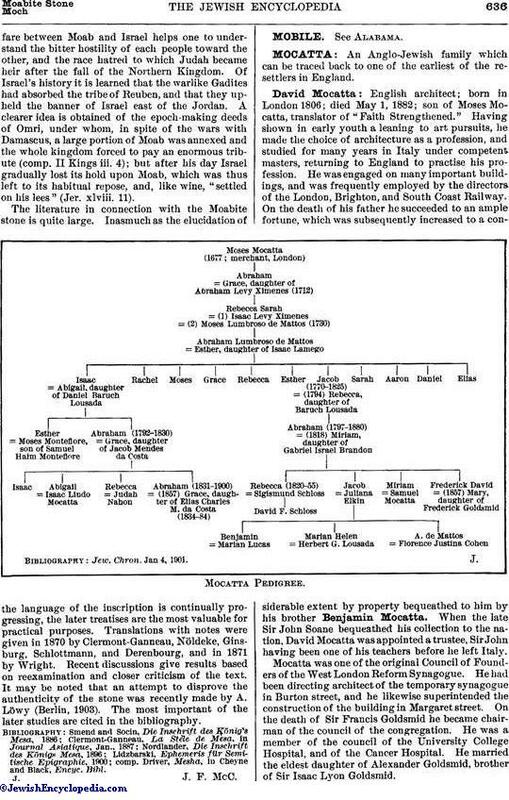 Translations with notes were given in 1870 by Clermont-Ganneau, Nöldeke, Ginsburg, Schlottmann, and Derenbourg, and in 1871 by Wright. Recent discussions give results based on reexamination and closer criticism of the text. It may be noted that an attempt to disprove the authenticity of the stone was recently made by A. Löwy (Berlin, 1903). The most important of the later studies are cited in the bibliography. comp. Driver, Mesha, in Cheyne and Black, Encyc. Bibl.